THE biggest shake-up in rail fares for more than 20 years has been launched by operators, with a consultation over how tariffs should be structured in future. The Rail Delivery Group said the outcome would be ‘revenue neutral’, so that the overall cost of travelling by rail will not change as the result of any reforms. The RDG wants to update and simplify a complex maze of regulations and brands, which has developed since 1995 when the last Ticketing and Settlement Agreement spelled out how fares should be set and sold. 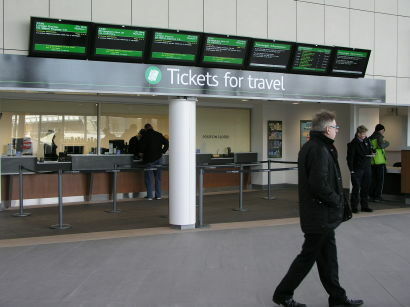 It assumed that all passengers would buy their ticket at a station ticket office and took no account of later developments, such as online booking and mobile ticketing. Research by KPMG has revealed that only one passenger in three who took part in a survey was ‘very confident’ that they had obtained the most suitable ticket for their journey. The present arrangements vary dramatically between operators. There are no standard definitions of ‘peak’, ‘off-peak’ and ‘super off-peak’ nor any national agreement about the times when they apply. The industry’s own website National Rail Enquiries labels each type of ticket, but does not say when it can be used. The development of Advance fares has added a new layer of complexity, aided by ‘yield management’ techniques which produce a range of different fares, each applicable to a quota of seats. When that quota has been sold, the next highest fare is offered instead. Research by Railnews has revealed that just one train from London Euston to Manchester later in May is currently offering no fewer than 43 single fares for the same journey. A further inconsistency concerns ticket vending machines. Each operator usually has a separate design of interface or screen, which a passenger needs to learn. Operators have been accused of ‘burying’ the best value fares, and even offering different rates for the same journey. The Rail Delivery Group has also commissioned an independent report from KPMG to identify key principles. These should be ‘transparent, predictable, fair, trusted, easier to use and value for money’, while also improving integration with buses, trams and metro services, be flexible to meet the demands of different markets, and avoid the need for any additional public subsidies.The final report will follow the consultation and the operators will then make proposals to governments, offering options for fares reform. Rail Delivery Group chief executive Paul Plummer said: “As part of the industry’s plan for change, we want to work in partnership to drive root and branch reform of well-meaning but out-dated fares regulation. Working together, we want to develop proposals to reform fares and regulation to make it easier for our customers to get the right ticket, enhancing trust in the system and supporting continued investment to improve the service. “Unpicking the regulation of a £10 billion-a-year fares system that underpins such a vital public service means there are no quick-and-easy solutions. The change that’s needed won’t be easy and the industry doesn’t have all the answers, which is why we want to hear views from passengers, communities and businesses in all parts of the country. Consumer groups have welcomed the news. Transport Focus chief executive Anthony Smith said: “Rail passengers want a rail fares system they can trust, that is simpler, offers better value for money and is more understandable. Fares and ticketing systems need to suit the way we travel now – there is a huge demand for smarter ticketing. Opening the debate on reform options is overdue. The ability to buy cheaper tickets for legs of a journey, so called split ticketing, is fast eroding trust in advertised fares. However, the RMT said ‘the internal review won't end Britain's great rail fare rip-off’.